New York University—the largest private research university in the United States—is an urban university with a network of campuses worldwide. Accreditation: Middle States Association of Colleges and Schools; graduate and professional accrediting agencies recognize degrees in all categories. Student Life: The Kimmel Center for University Life houses dining facilities, student lounges, and the Skirball Center for the Performing Arts. Athletics: Two facilities contain pools; a diving tank; saunas; courts for basketball, squash, and tennis; weight rooms; dance and yoga studios; and a track. Twenty-one intercollegiate teams compete in NCAA Division III and the University Athletic Association. Of the 25,700 undergraduates currently enrolled, 18% are African American or Latino. Students come from all 50 states and 130 countries, with international students making up 17% of the total student body in New York. NYU Abu Dhabi’s student body represents more than 100 countries, and NYU Shanghai is 50% Chinese and 50% international. Students benefit from extraordinary liberal arts curricula, research opportunities, and an extensive professional network. 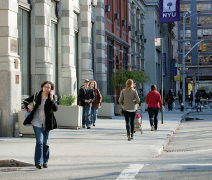 With campuses in New York, Abu Dhabi, and Shanghai, NYU has become one of the world’s first truly global universities. Greenwich Village is NYU’s campus neighborhood, and New York City is an extension of NYU’s campus. The world capital of finance, communication, and culture, New York City offers the best in theater, dance, music, film, libraries, museums, and galleries. Here you have access to internships that complement course work and professional goals. NYU’s alumni network of nearly half a million and affiliations with corporations, government agencies, and social institutions will help you launch a successful career. NYU’s comprehensive liberal arts campus in China’s financial and commercial capital gives you access to Asia’s top companies, media outlets, and museums for class trips and professional opportunities. As at the other two campuses, you’ll gain an academic foundation in the humanities, social sciences, and natural sciences before focusing on your major. Applicants will be considered for all possible NYU financial aid—including need- and merit-based scholarships—if they fill out the CSS/Financial Aid PROFILE, the Noncustodial Parent PROFILE (if applicable), and the FAFSA. Admission to NYU is highly selective. The Admissions Committee evaluates each application based on many factors, including your academic record, a combination of standardized test scores, letters of evaluation, and your personal statements and essay. The committee also reviews your talents, personal attributes, and goals. 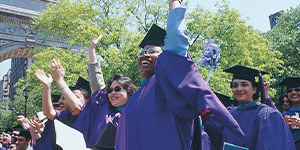 For details, visit admissions.nyu.edu.